DC Metro officials this week confirmed that the final draft of their ‘SafeTrack’ repair plan is going to be delayed as metro officials continue to work with the Federal Transit Administration to meet safety guidelines. Metro General Manager Paul Wiedefeld announced initial draft of the huge repair plan on May 6, and promised the final draft yesterday. A track explosion two weeks ago prompted FTA to step in and stop Metro’s plans to release the final draft. FTA issued a set of actions to Metro on May 7 and warned that they had to take the actions immediately or risk a full system shutdown for safety reasons. FTA has blasted Metro publicly for failing to have enough workers trained on emergency response, running too many trains in service at one time and not doing enough daily safety inspections. The FTA order also addressed major employee negligence issues, such as train operators running red lights and running trains too fast. New speed restrictions are now in place and are slowing daily commutes for thousands of passengers. The SafeTrack program proposes to repair the entire Metro system over a year with single tracking, line closures and reduced service hours on all lines. As Virginia railroad injury attorneys, we find it alarming that so many safety failures have crippled the DC Metro system. We remember a few years ago when two DC Metro trains slammed into each other, killing four people. There also have been multiple fires on Metro lines and several explosions over the last three years. We hope that those who have been injured by DC Metro during these multiple safety failures are able to recover from their injuries. Our railroad injury law firm has helped victims of many train accidents, and we know that small safety errors can lead to deadly results. After several years worth of DC Metro safety incidents that have led to several deaths and dozens of personal injury lawsuits, the general manager for the trouble-plagued metro system fired 20 station managers as part of his effort to reform the system. The general manager, Paul Wiedefeld, followed through on earlier threats to fire managers in the troubled public transit system, after a catastrophic start to the year with multiple tunnel fire and smoke incidents that sickened many passengers. Also, a smoke and fire incident in 2015 led to the death of one woman and more than 70 personal injury suits for people who were sickened by smoke. In that 2015 case, electrical smoke near the L’Enfant Plaza station overcame the train and killed a woman and left the other passengers needing medical attention. The mass firings came just a few days after DC Metro introduced a new ten month repair plan called SafeTrack that will result in virtual 24/7 work on metro tracks and equipment. This will result in entire sections of the system being closed for days at a time and many instances of single tracking trains during rush hour. This will cause major delays and headaches for tens of thousands of workers, but is viewed as essential to making the system safe. 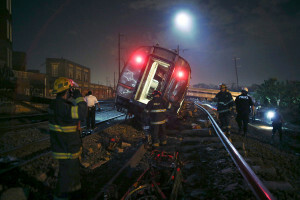 Our train crash and accident lawyers in Virginia hope that DC Metro gets its act together soon. We have reported on the above tragic train disaster in 2015 before. Defective power cables generated a massive smoke cloud that overwhelmed hundreds of passengers. Passengers tried to flee the train by forcing open the doors. Power was cut off to stop the fire on the tracks, which meant that the train could not move, leaving passengers trapped. We hope that the new safety emphasis with Metro means that there will be no more injuries and deaths, but if there is, we also hope that the injured parties will seek the counsel of experienced train accident personal injury lawyers.